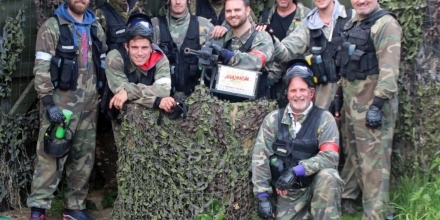 Great day out was had by everyone at Lonsdale earlier this summer enjoying Paintball battles at Mayhem in Abridge, Essex. Well organised day and fortunately for boss Richard Burgess, it was hard to distinguish who was who due to the protective clothing and face-masks! Next year, suggestions have ranged from cup-cake making to sky-diving, but likely we will plump for something in between on the ‘action’ scale! From the left: Steve Thomas, Victor Marenko, Steve Smith, Karol Banczak, Vytas Stelmokas, Ted Gilding (on gun), Paul Doherty, Nigel Mant (kneeling), Luke Stockwell and Richard Burgess.